The Great Recession has shuffled Clay Jannon away from life as a San Francisco web-design drone and into the aisles of Mr. Penumbra’s 24-Hour Bookstore. But after a few days on the job, Clay discovers that the store is more curious than either its name or its gnomic owner might suggest. The bookstore’s secrets extend far beyond its walls. I was in need of a new audiobook, so I decided to visit my ever-growing to-be read list on Goodreads for some suggestions. 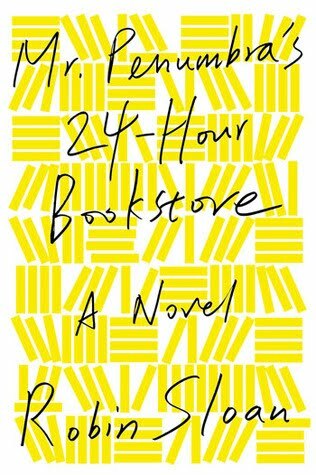 Highly recommended by my boss, I sampled Robin Sloan's Mr. Penumbra's 24-Hour Bookstore, liked the reader, and decided to give it a whirl. I'm not sure I LOVED it as much as she did, but it was definitely a thoroughly enjoyable read. Clay Jannon has a tech background, web design to be exact, and finding himself unemployed, he wanders into Mr. Penumbra's 24-Hour Bookstore. The customers are scarce, and his employer is eccentric to put it mildly, but there is something about the small space filled floor to ceiling with books that intrigues young Clay. And then he discovers that Mr. Penumbra's bookstore isn't quite what it seems. Coded messages in books. A secret society. And the clash between the digital age, the power of google, and the importance of the written word hold high stakes for the little bookstore. But seriously, it really did feel familiar. Not that the story was a formulaic retelling of something I had read before. And not that the characters seemed like stock individuals you see in any book. It was familiar in the good way...that feeling you get when you discover a story that seems to fit you, your reading tastes, your humor. It was a little bit of Ready Player One, a little bit of The Da Vinci Code, and maybe a little bit of some heroic fantasy novel with a hero, a wise counselor, and a mage. Both Clay and Penumbra are likable characters. Clay could be any guy you meet on the street. He's smart but not too smart. He's curious but lacks a bit of common sense which makes him endearing. And Penumbra reminded me of a grandpa. Soft spoken and supportive. A grandpa that would go around talking about "the youths" and all that they get up too. There wasn't a lot of character development. The characters weren't really the main focus of the story, but the lacking didn't hurt the story either. It was fast paced and interesting, keeping you in it until the last page. 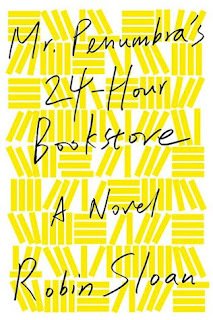 Mr. Penumbra's 24-Hour Bookstore is an adventure novel and sort of a love letter to both getting immersed in books (the seeking of knowledge) and the power at our fingertips with each computer stroke. It never came off as a cautionary tale about the evils of technology. Thank goodness. The narrator is fantastic. The book is fun. And the world could definitely use a 24-hour bookstore run by a sweet, curious, mysterious old man.